A hydrogen fuel cell is an electrochemical cell that uses a spontaneous redox reaction to produce current that can do work. The net reaction is exothermic. Combining the 2 half cell potentials for the electrochemical reaction gives a positive cell potential. The hydrogen flows to a platinum catalyst connected to the anode. Molecular hydrogen is dissociated to atomic hydrogen on the metal surface and the atomic hydrogen is oxidized. The protons travel through a solid electrolyte, the polymer electrolyte membrane or PEM, and the electrons travel through the external circuit. Molecular oxygen is reduced at the cathode and combined with protons to form water. The theoretical voltage for a hydrogen fuel cell should be 1.23 V, however typical potentials are 0.6 to 0.7 and actually drop as the current flows. Why? An overpotential is required to make the cathode reaction proceed at a fast enough rate. Charge carriers lose energy as heat (resistance) as they flow through the media. Mass transfer to the electrodes is slow. NOVA has information on automobiles with hydrogen fuel cells on their website. 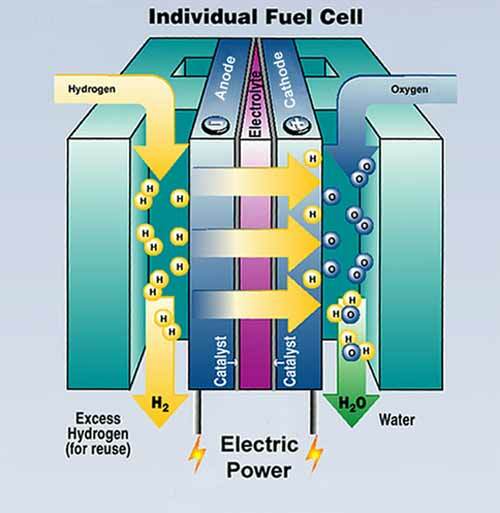 A major problem with hydrogen fuel cells is the source of the hydrogen. The quantity of H2 in the atmosphere is very low so it must be produced. Currently, most hydrogen is made from natural gas and petroleum. It can also be produced from coal in the water gas and water gas shift reactions. All of these use the energy stored in fossil fuels and generate CO2. Electricity generated from other means (nuclear power, hydro power, or solar energy) can produce hydrogen through electrolysis. This is the reverse of the hydrogen fuel cell reaction. It is clear that H2 is an energy transfer medium rather than a fuel. The electrochemical reaction produces carbon dioxide, a greenhouse gas. The anodic reaction requires a catalyst that contains expensive, precious metals. A mixture of ruthenium and palladium is typical. Another drawback is the toxicity of methanol. Methanol can also be used with hydrogen fuel cells. Steam reforming of methanol at 250 deg C produces CO2 and H2 along with a small amount of CO.
Based on G/ H for the formation of water from hydrogen and oxygen, the efficiency of a hydrogen fuel cell should be nearly 80 % (corresponding to a cell potential of 1.23 V). In practice, the maximum cell potential of a hydrogen fuel cell is 0.95 - 1.0 V initially because of polarization losses as the electrode surface. 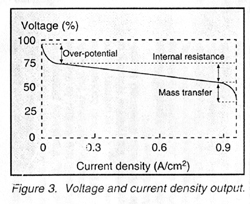 Under a load, losses of energy due to resistance are significant and the true cell potential is between 0.6 and 0.8 V. The actual efficiency is approximately 0.7 V/1.48 V, less than 50 %. The indirect methanol fuel cells are much less efficient because of the heat loss in the reforming reaction.